The film Peterloo has been reviewed as one of the cinematic achievements of 2018, dramatising the people and events that led to the infamous ‘Peterloo’ massacre in August 1819. Respected film-maker Mike Leigh created the film using historical records and sources from the period, as he and historical adviser Jacqueline Riding explained to the HA in a recent interview. You can view a short preview of the interview below. Leigh's hard-hitting film does not shy away from the social problems and injustices that led to a crowd of around 60,000 gathering in St. Peter’s Field in Manchester to campaign for the reform of parliamentary representation. 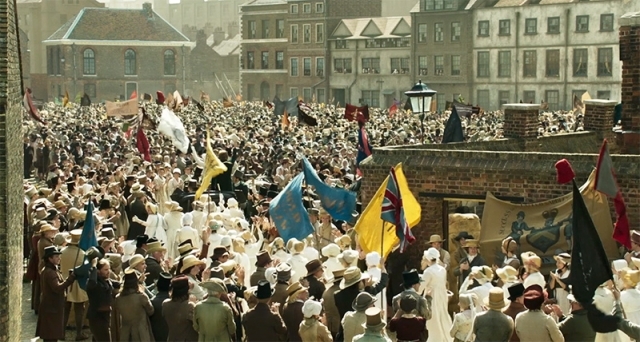 At the film’s ending the audience are left to explore their own responses to the events at Peterloo, and how they have affected society today. The HA team were fortunate to interview director and writer Mike Leigh and the film’s historical adviser Jacqueline Riding. Leigh is famed for his improvisational approach with actors rather than a set script, and talks about how that approach sat alongside original documents and diaries from the 19th century. This interview also explores the selection of sources and how they were applied to create the film, and what impact the film may or may not have with its audience. You can view a short preview of the interview above. The full-length interview will be published on the HA website later this year with an accompanying blog from Jacqueline Riding on her experience of working as a historical adviser, the process of using historical sources for film, and how it has affected her experience as a practising historian. The National Archives classroom resources: Protest & democracy 1818-20 - how close was Britain to revolution?